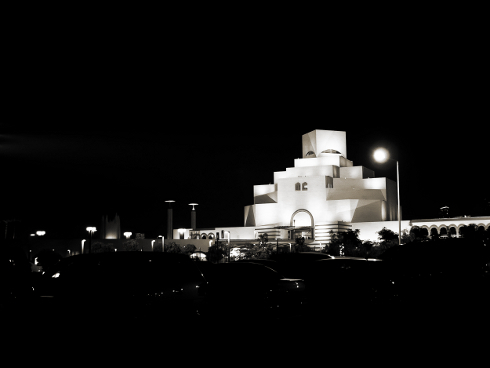 Today, the historic launch of the Creative Commons in Qatar was held in the Museum of Islamic Arts. Food was from the ‘W’, good as usual. I notice that the ‘W’ has got quite a lot of media coverage in the last six months. Lots of events happening and the ‘W’ name is constantly in the news. Something really good must be happening. As I walked into the museum, the DJ was playing some uninspiring music. Looks like the Creative Commons website is bankrupt of some quality music for the evening. Maybe the DJ hasn’t heard about Creative Commons! Maybe the DJ was not impressed with the MIA crowd. He should listen more to QFRadio. They play some fantastic fusion music, usually before noon. The museum is literally a jewel. Shining marble all around and perfect angles of a pyramid, both inside and outside. Not good for a launch party that involves lots of speech and videos. The result was a horror show in echo. The podium was perfectly placed at the center of the pyramid. The proceedings were just marginally legible. So much for legalese on copyright-related issues. As I walked out, I couldn’t stop marveling at the clear sky and a cool evening. Both rare for this time of the year. I shot this image of the MIA from the parking lot. The building, is definitely a jewel. Guys and gals who like to appreciate Dutch classical paintings have one more week to go before the ‘Dutch Masters’ exhibition from the Rijksmuseum moves from Doha.